This volume of Celebrate Broadway is made up entirely of duets. The songs range from up-tempo numbers to ballads to song-and-dance routines. The one thing they all have in common is that they’re sung by two people, sometimes in love, sometimes in competition, and sometimes unaware of one another, but always sharing mutual feelings. Lincoln Center Theatre’s production of Cole Porter’s classic Anything Goes was directed by Jerry Zaks and featured Patti LuPone as Reno Sweeney and Howard McGillin as Billy Crocker. The two characters aren’t in love but they think the world of one another. The two lead characters in this musical are in love but they just can’t admit it. Rodgers & Hammerstein’s Oklahoma! remains a great show, thanks to its blissful score and its homespun philosophy. R & H went on to write better musicals and better songs but nothing as just plain downright American as this one. Rodgers and Hammerstein were the producers of Annie Get Your Gun, which was originally supposed to have had a score by Jerome Kern. However, Kern died and so Rodgers and Hammerstein turned to their good friend Irving Berlin to replace him. The result was one of the most hit-filled musicals in theatre history, and “Anything You Can Do,” the “can you top this” classic. This unlikely duet, “Unworthy of Your Love,” between John Hinckley (singing to an unseen Jodie Foster) and Squeaky Fromme (singing to an unseen Charles Manson) was one of the high points of Stephen Sondheim’s controversial musical Assassins. Among other things it proved that if Sondheim wanted to (on top of all his other accomplishments), he could probably have penned several hit songs for the Carpenters. On the other end of the duet spectrum is “I Remember It Well” by Alan Jay Lerner and Frederick Loewe, here sung by Broadway legend Alfred Drake and Maria Karnilova (Fiddler on the Roof’s Golde) in the original Broadway cast recording. The film of Gigi won eight Academy Awards®; the Broadway version produced fifteen years later won a Tony Award® for Best Score in 1974. The concept album for Jekyll & Hyde, yet to be produced on Broadway, featuring Les Misérables star Colm Wilkinson and newcomer Linda Eder, has proved to be one of the more popular show recordings of recent years. The songs have been featured during Olympic competitions and, one year, three of the ten finalists at the Miss America competition sang songs from the show’s contemporary pop score. In 1966 The Roar of the Greasepaint – The Smell of the Crowd was considered to have a pop-oriented score. In fact, Tony Bennett’s version of the show’s hit “Who Can I Turn To?” is partially credited with the show’s success. Back in those days people went to shows because of songs (!) and not sets and costumes. The old-time vaudeville number “Where Would You Be without Me” is indicative of the playfulness and pizzazz that is typical of this terrific Anthony Newley–Leslie Bricusse score. The musical version of the popular film My Favorite Year wasn’t a success when it was produced by Lincoln Center Theatre in the 1992–93 season, although Andrea Martin did win a Tony Award® for her performance. However, the score by Once on This Island’s Lynn Ahrens and Stephen Flaherty has much of that aforementioned pizzazz and playfulness. “Shut Up and Dance” features Evan Pappas and Lannyl Stephens and a very cooperative offstage chorus. Fiddler on the Roof is one of the most popular musicals of all time. Produced by Harold Prince with a book by Joseph Stein and a score by Jerry Bock and Sheldon Harnick, the show was brought to vibrant life under the keen eye of director/choreographer Jerome Robbins. The classic duet “Do You Love Me” between Zero Mostel and Maria Karnilova (both of whom won Tony Awards® for their performances) is a love song for all couples whose companionship has endured the test of time. Arguably the greatest musical comedy of all time, Guys and Dolls is just about perfect. In a score by Frank Loesser that contains tons of popular songs, “Marry the Man Today” is often overlooked. Here, two completely different types of women, the proper Sarah Brown (Josie de Guzman) and the not-quite-improper Miss Adelaide (Faith Prince) discover a common bond and goal. This musical, never produced on Broadway because of the other version of Phantom, contains a beautiful romantic score by Tony®-winning composer Maury Yeston. The show is a phenomenon of its own, proving that you don’t have to play on Broadway to be a Broadway-style hit. Here in “You Are Music” Glory Crampton (as Christine) and Richard White (as the Phantom) sing of their love of music and their growing love for one another. Mary Martin and Robert Preston, two of the greatest Broadway stars of all time, teamed up for the two-character musical I Do! I Do! which covered the life of a marriage through good times and bad times. “The Honeymoon Is Over” is the energetic synthesis of the bad times. In 1954 Kismet won six Tony Awards® including Best Musical and Best Actor (Alfred Drake). Utilizing themes by Alexander Borodin, the score is lush in a way that Broadway scores aspire to be but rarely seem to accomplish. ”Stranger in Paradise” was a huge pop hit. 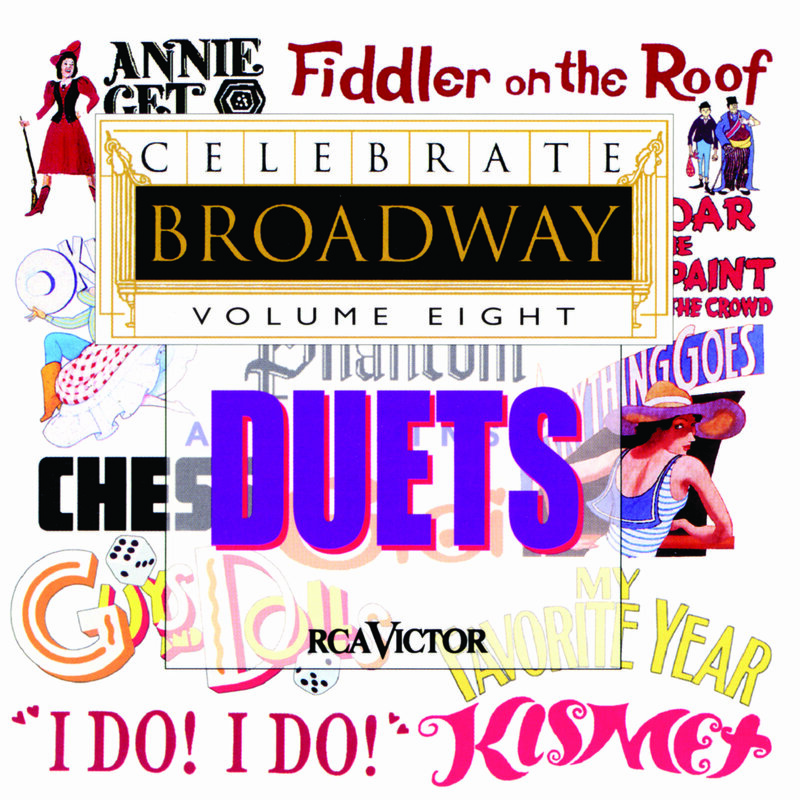 While at first it may seem corny and even a bit overwrought, by the time it is over you have to admit that over-the-top lushness provides the perfect romantic lift to end this collection of Broadway duets.